Get Ahead and Ace those Exams! The June exams are looming and by now most of you are starting to think about studying and improving your results. Some of you may well have broken out in a complete sweat, just from the anticipation of the nightmare ahead! Stop right there and take a deep breath. Here are 7 awesome tips to help you study smarter and avoid that nervous breakdown before your exams. Start your study period the right way by ensuring you eat a healthy balanced diet and that you get enough sleep. Diet and rest are essential to proper brain functioning. You can also boost your brain with foods such as apples, nuts, berries, dark chocolate and fish. 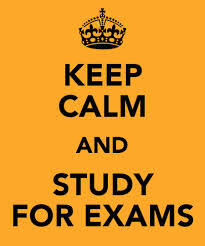 Set aside some time today and plan for your exams. This is one of the most important things you can do. Map out a study time table according to your exam schedule so that you have enough time allocated to each subject. You will feel calm and in control as you work your way through and cross off each day. There is no better way to learn than by teaching yourself. Take one subject at a time and re-teach yourself important concepts by making notes and explaining things out aloud. Another tried and trusted method is to form a study group and discuss work with your friends. This makes studying far less boring and more interactive. There are loads of websites out there that provide helpful tools such as study notes, worksheets and exam papers. Visit websites such as www.gutsytutoring.co.za who provide matric exam papers to practice on. It’s completely free and will greatly improve your knowledge for your exams. Where you study is just as important as how you study. Many students make the mistake of thinking that they can study in the living room with the TV blaring and their siblings running rampant all over the place. However, this really doesn’t work. In order to excel at your studies you have to find a quiet place to work that allows you your own space and the ability to focus. If you are struggling with a particular subject, don’t let your anxiety hold you back. Work with a teacher after school, ask your friends for help or talk to your parents about working with a tutor. A private tutor is one of the best tools you can have at your disposal as they have experience working with students, possess extensive knowledge and know what is expected from you in your exams. As crucial as it is to study hard and dedicate enough time to your exams, it is just as vital to take breaks during the day. Last minute, late night cram sessions will only result in you crashing the following day and feeling lethargic, unproductive and awfully stressed out. Avoid the early onset of grey hairs and allow yourself 15 minute rest periods for some fresh air or make a quick healthy snack between studying. Yep, it’s possible! There are tons of sources out there that provide audio recordings of lessons. Download them, put them on your Ipod and let the knowledge flow over you as you fall asleep listening to the soothing sounds of conquering those algebraic equations!